CALL:269-248-5793 Let Us Do The Searching For you. Get Help Now! Art therapy is a treatment modality of substance abuse. As clinical research and exploration continues to unearth and account for the unique and complex behavioral care needs of individuals struggling with substance use disorder (SUD)—of whom there are twenty million in the United States, according to data from the Substance Abuse and Mental Health Services Administration (SAMHSA)—one of the most pertinent and effective developments has been the increased utilization of art therapy. When integrated into a comprehensive substance use treatment program, including detox, one-on-one counseling, and group therapy, art therapy has proven to be one of the most powerful and effective supplemental practices for those who suffer from addiction and co-occurring mental health issues. The American Art Therapy Association (AATA) defines art therapy as a therapeutic practice in which clients, facilitated by the art therapist, use art media, the creative process, and the resulting artwork to explore their feelings, reconcile emotional conflicts, foster self-awareness, manage behavior and addictions, develop social skills, improve reality orientation, reduce anxiety, and increase self-esteem. Art therapy has also benefited those who have suffered from traumatic brain injury, cancer, chronic pain, and more. The process has proven remarkably effective in conflict resolution, development of interpersonal skills, articulating emotions, and interpersonal skills development. It is important to note that the application of art therapy for adults may differ from that of art therapy for children. One of the primary goals of art therapy is to help patients safely and comfortably articulate their emotions in ways they often can’t in traditional talk therapy because they feel too guarded or judged. 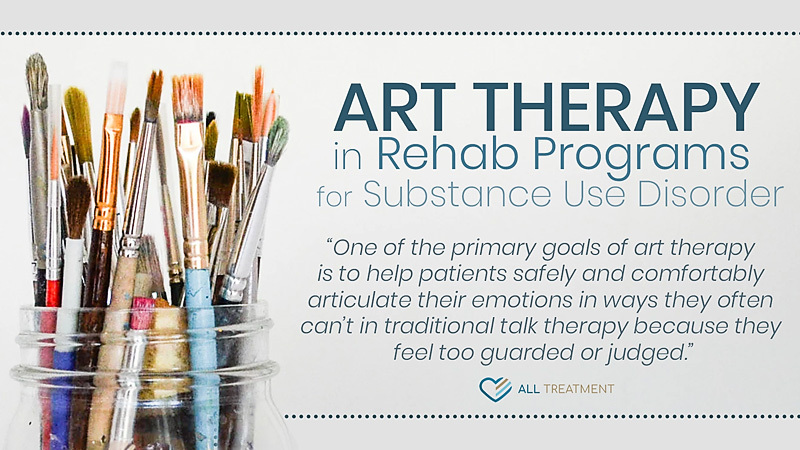 Patients work with a licensed and certified art therapist and engage in practices like painting, drawing, and sketching to process document, and discuss traumatic or dysfunctional experiences that may have led to or sustained their drug or alcohol use. Art therapy can be and is practiced in a wide variety of settings, including inpatient and outpatient rehab programs, hospitals, doctors offices, schools, forensic mental health facilities, and more. In the context of substance abuse treatment, the therapy is offered as part of an overall customized treatment approach developed at the time of intake. Patients who participate in art therapy in clinical treatment very often engage with the therapy after the conclusion of their program and even practice it independently. Art therapy activities can be an integral part of post-treatment recovery, and there are multiple resources of which those in post-treatment recovery can avail themselves, including free art therapy classes both online and in person. Interested participants do not need to have professional or even occupational experience with art. Art Therapy Statistics: How Effective Is Art Therapy? Expressive and art-based therapies for mental health treatment and stress reduction date back to the 1940s and have seen markedly successful treatment outcomes since their inception. One recent study from the Mayo Clinic points to the efficacy of bedside art intervention in improving the lives of cancer patients. The study also indicates that viewing, discussing, and interpreting existing art can help in group discussions and motivate patients to become more empowered to engage in their own recovery rather than staying stagnant in a state of passivity or inaction. Most recently, a collaborative examination between Israel’s University of Haifa, Italy’s University of Bergamo, Florida State University, and Drexel University revealed art therapy’s effectiveness in a range of populations, including female cancer patients, patients with advanced heart failure, schizophrenia sufferers, patients diagnosed with mild to severe dementia, and more. More often than not, drug and alcohol addiction is the product of an underlying mental health issue that must be addressed in behavioral rehab along with the immediate lifestyle damage that addiction has caused. These issues may include depression, anxiety, family dysfunction, trauma, personality disorder, and more. Internalizing severely negative experiences without any outlet to deal with them is often a direct pathway to self-medication with drugs and/or alcohol. The role of art therapy in trauma therapy can be especially critical as patients work toward safely externalizing their traumatic experiences. Very often, patients don’t even realize the role that these experiences played in the development of their SUD until they have a chance to work through them with a professional. Art therapy helps patients access their confidence and confront their dormant emotions so they can manage them independently without resorting to drug and alcohol abuse. Art therapists must be licensed and credentialed and possess in-depth knowledge of visual art (painting, drawing, sculpture, etc.) as well as of psychology and counseling. Every licensed and practicing art therapy professional must have a master’s degree and adhere to ethical practices set forth by the AATA. The organization also has a database of treatment professionals that are currently licensed and equipped to practice. It’s important to realize that not every substance abuse treatment facility offers art therapy. For those who are interested in availing themselves of this modality, it would be best to research their prospective facility’s resources prior to entry. Art therapy is very often offered by private facilities that also offer additional holistic and occupational modalities such as fitness therapy, music therapy, yoga and meditation, poetry, and even equine therapy and other types of animal therapy. Like all other types of occupational therapies, art therapy should occur as part of a comprehensive treatment program alongside fundamental practices like detox, psychiatric therapy, and other supplemental therapies. Once patients complete their treatment program, they can and very often do continue to engage in the process to continue the progress they made in treatment. Art therapy may also be covered under private insurance; however, interested participants are encouraged to consult their prospective treatment facility and insurance provider. Variables that can determine coverage include the specific plan type, nature of the patient’s specific condition, type of services provided, and whether the service is determined to be medically necessary. Patients may also be able to find free online art therapy courses in their area. Art therapy has proven to be a valuable and effective care resource for those suffering from drug or alcohol use disorder (AUD), even for patients who have not considered themselves particularly artistic in the past. If you or someone you care about is struggling with SUD, see if art therapy is right for you. The effectiveness of Art Therapy With Adult Clients in 2018 – What Progress Has Been Made?